"A family favorite. Expect a few wrinkled noses maybe at the title, but result is worth the effort. Maybe not for beginning cooks since there's a couple potentially tricky steps. Serve a cup of jam over a bar of cream cheese with crackers, or as a spread for meat sandwiches. Keep in refrigerator in covered container for up to two weeks." Heat vegetable oil in a heavy skillet over medium heat. Stir sugar into vegetable oil with a wooden spoon, stirring constantly until mixture is a light caramel-color, about 10 minutes. Mixture will be very hot. Stir onion, salt, and black pepper into sugar mixture. Onions will immediately start to caramelize. Stir frequently over medium heat until sugar has dissolved and onions are browned, about 15 minutes. 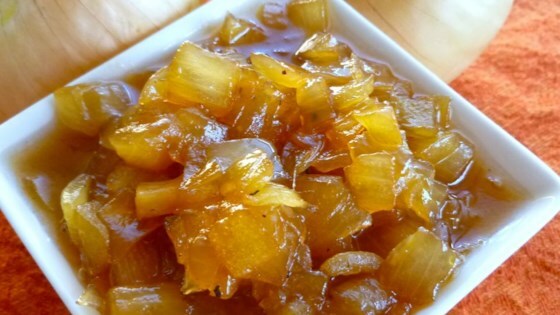 Pour red wine vinegar into onion mixture and simmer until mixture has a jam consistency, about 30 minutes. Let cool to serve.